system for piano - revoiced open for jazz guitar. 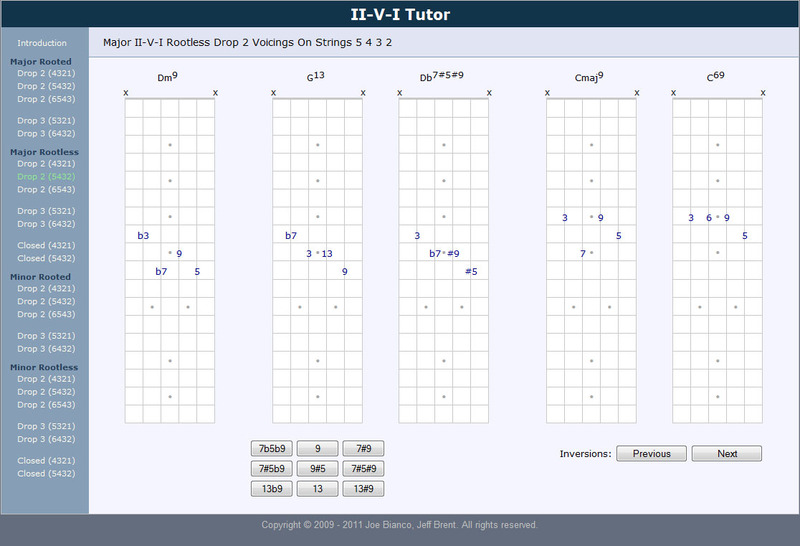 The chord components' degrees are mapped onto an interactive fretboard. and exposition of the chord relationships. Learn to solo in the BeBop idiom. The "Spare and Ringy One", the "Pushed Three" and the "Busy Four"
A cool and useful idea for improvising over ii-V7-I changes. Complete with MIDI audio examples. Learn to solo in the BeBop idiom. Complete with MIDI audio examples & guitar tab. Creating Melodies using "The Suggestive Method"
The natural path to melodic construction. A cool and useful idea for improvising over ii-V7-I changes. Complete with MIDI audio examples. A precise and intuitive way of notating chords and scales. Demystifies John Coltrane's "Giant Steps". Some ideas for reharmonizing non-Jazz songs. Musical evolution and the loss of innocence. How long should I practice every day? Derived from the same materials as above. The chord components' degrees are mapped onto an interactive fretboard. The V7alt buttons allow for instantaneous comparative analysis. An incredibly intuitive exposition of chord relationships. Special thanks to Joe Bianco for this. Sidewinder patterns consist of a sequence of identical fixed melodic intervals chromatically ascending or descending. Practical advice on doing transcriptions. Using the last four notes of minor 7th chords or dominant 7th chords as melodic soloing choices. Complete with MIDI audio examples. choices. Complete with MIDI audio examples.